Available anytime for first timers or if you are renewing! Apply for an Alcohol Service Permit from the Oregon Liquor Control Commission (OLCC). Complete our online OLCC course, and save your course proof of completion. 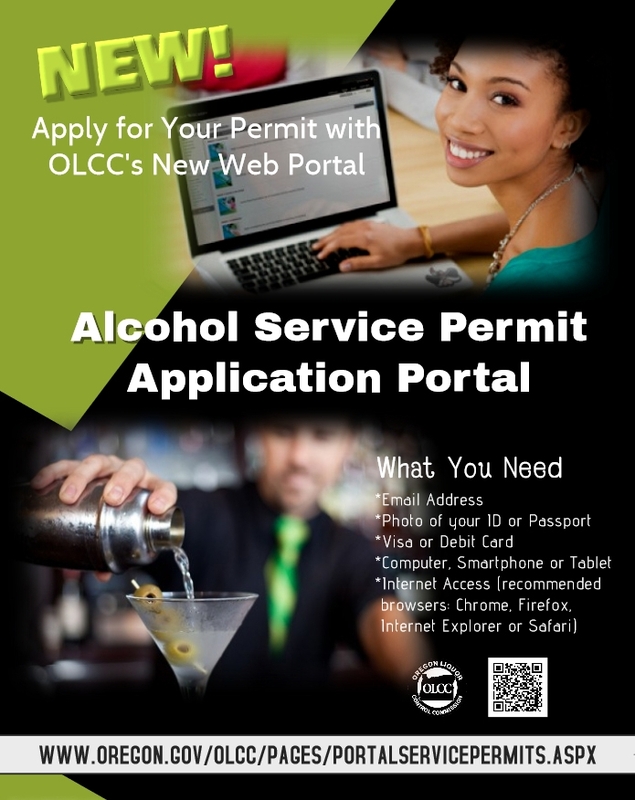 Visit OLCC's Portal website for the online alcohol service permit application and take the final test. OLCC will match up your test to our online course and issue you the permit. OLCC has now made the application process and final test process easier. You can now pay for your application online with their new system. No more printing applications and mailing in checks or money orders. That's right you fill out the form online and pay with a credit card now. The OLCC permit certification is required for anyone who mixes, sells, servers, or manages anyone who mixes, sells or serves alcohol in the state of Oregon. This course and website was designed with multiple devices in mind. All course content is in HTML5 which means it will work on Ipad-Iphone-Android-Desktop and Mac Devices. You do not need Adobe Flash Player and there is no need to download any other browser to take our course. We have tested our course in Firefox, Edge, Chrome, Opera, Safari. There is a no time limit requirement for this OLCC Server Permit training course. This is a self paced OLCC course so you can learn as fast or as slow as you want. Most people complete the training in about 1 to 1.5 hours. After you complete our online course you will be directed to the OLCC Portal site where you can take your final test and submit your alcohol service permit application. As of May 2018, the OLCC will now only accept alcohol service permit applications online. You will need to visit the OLCC Portal and register and pay for the application online. The OLCC has removed the Online Renewal Alcohol Permit training course. The OLCC has simplified the online training with just one course for everyone. It doesn't matter if you are a first timer or have had your permit for 20 years. The online course is now a one size fits all training course. With over 25 years of experience in the restaurant and bar business as an owner and manager. We also have the knowledge and expertise on how to deal with tough situations. We also understand what you have had to deal with or will have to deal with when serving and selling alcohol. With over 12 years of teaching the OLCC Alcohol Server Education course and over 75k students have successfully passed our Oregon Liquor Control Commission Permit training course. Enroll in our A+ Server Education training course now! Most students complete the training course in about 1 to 1.5 hours. When you pass the exam, we will submit your test answers to the OLCC for them to grade. Get the training course you need in a mobile-friendly and easy-to-use format today. Oregon's alcohol sale and service laws, including DUI laws. At the end of the course you will take a 30 question multiple-choice practice test. After you pass the practice test you will be given a Proof of Completion. You will need to download and save your Proof of Completion to take the Final Test on the OLCC Portal. We will direct you to the OLCC Portal website where you can register and upload your Proof of Completion, and take the OLCC Final Test.